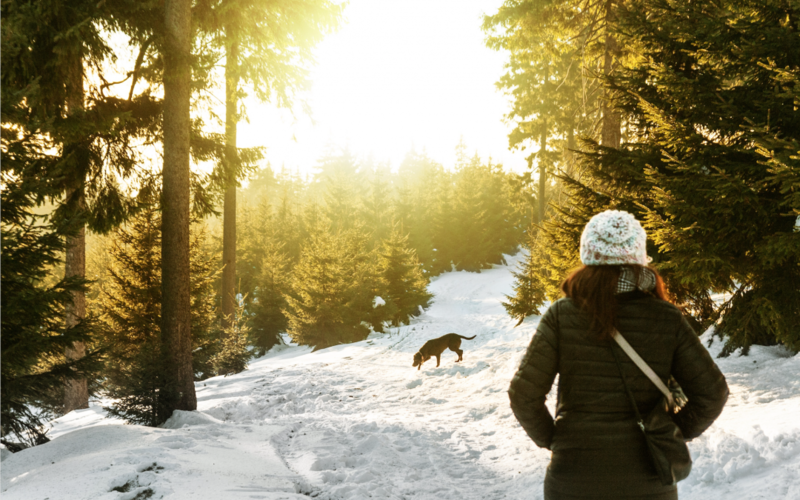 The question becomes: will February bring more of the same momentum? Or is it time for a little mean reversion to the downside? Because with the Dow Jones just notching it’s 6th consecutive week of gains, I think it’s safe to say the bulls have shown up to the party! That’s why I want to quickly recap this short-term momentum shift and, why it might be able to keep going. Then I’ll show you a few charts I like for the week ahead. So let’s dive in! The question now is whether we get a repeat of 2018, or whether bulls can flip the script and keep pushing prices higher. Personally, I’m open-minded to both scenarios, but a little more inclined to the latter. Breadth has been strong and earnings reactions (to lowered expectations) have been good. I don’t think it’ll necessarily be smooth sailing. There’s no denying prices have run a long way in a short amount of time. 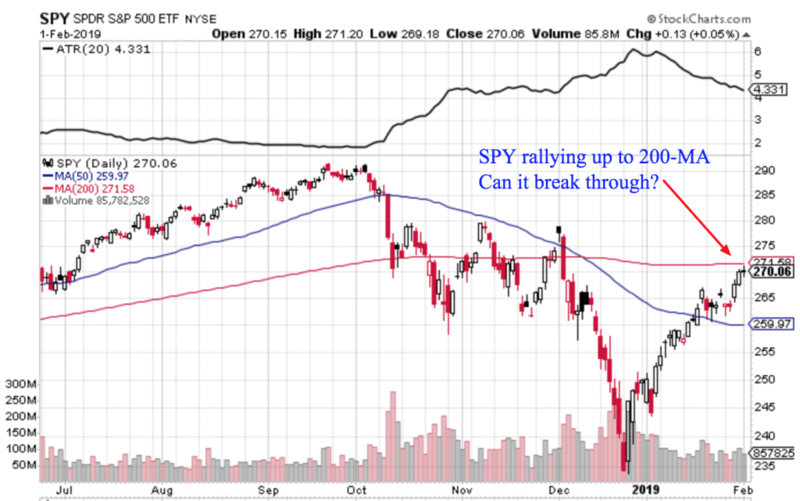 And as you can see on the daily chart below, SPY is about to collide with the 200-day moving average, which it’s been below for quite some time. Unlike 2018 though, this strong bounce came after a vicious decline… and not a blow-off top! So I think there’s a reasonable case to be made people really ratcheted down their expectations into the end of the year, and now earnings don’t look as bad as they thought. In the highlights below from FactSet, you can see earnings results have actually been pretty good, with 70% of companies beating on EPS. But on the other hand, all that negative forward guidance is also a bit concerning. Perhaps with so much trade uncertainty between the world’s two-largest economies at the moment, it’s possible companies are low-balling their guidance due to uncertainty. But I guess time will tell how this actually plays out though. 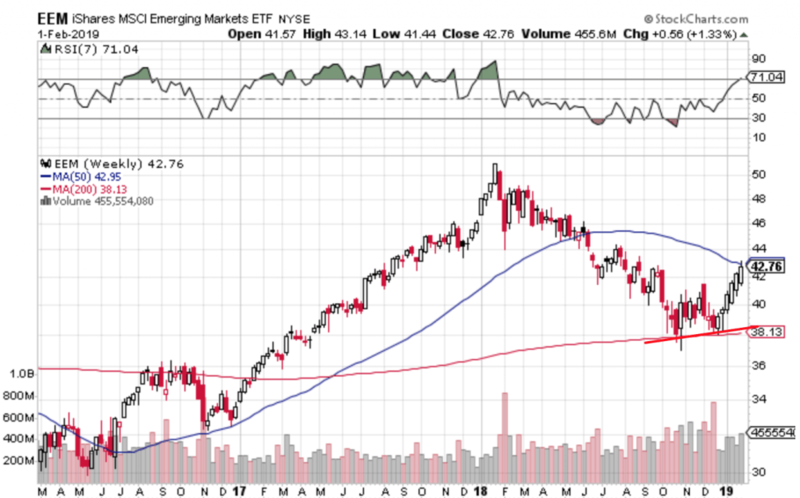 Moving on, another clear pocket of strength I want to point out is emerging markets. For the last few weeks I’ve been noting the outperformance here, and it looks like the momentum is set to keep running. I think strength in emerging markets also helps global equities as a whole. Last year emerging market and ex-US stocks pretty much dripped lower, and it seemed to lag on equities as an entire asset class. With EEM and European stocks now bouncing, I’m starting to believe this bull market is ready to run again. Since the market has been bouncing so much the last few weeks, there are lots of individual stock picks that are setting up well right now. So let me show a few of my favourites! 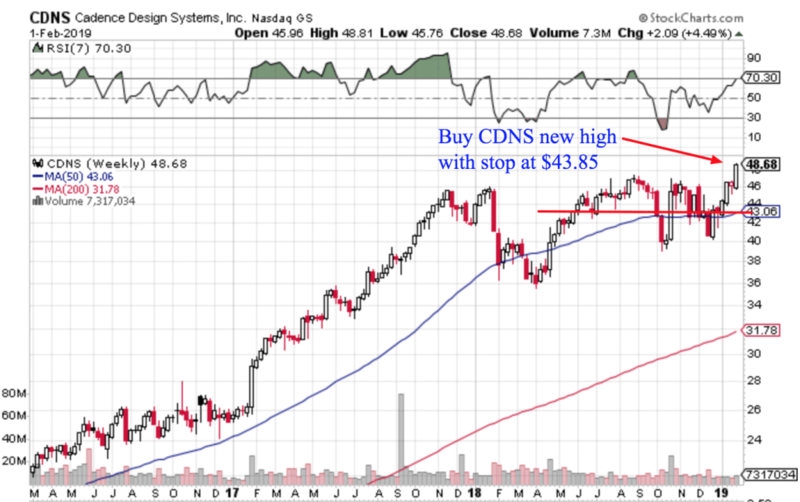 To start us off, let me show you a recent buy of mine, as I picked up shares of Cadence Design Systems (CDNS) this week. You can see after a bunch of back and forth the last few months, it’s finally starting to get going. This one still has earnings around the corner, and be aware these quarterly announcements can have a big impact on your trading strategy. So here’s how I trade through earnings, but what works for you may differ. 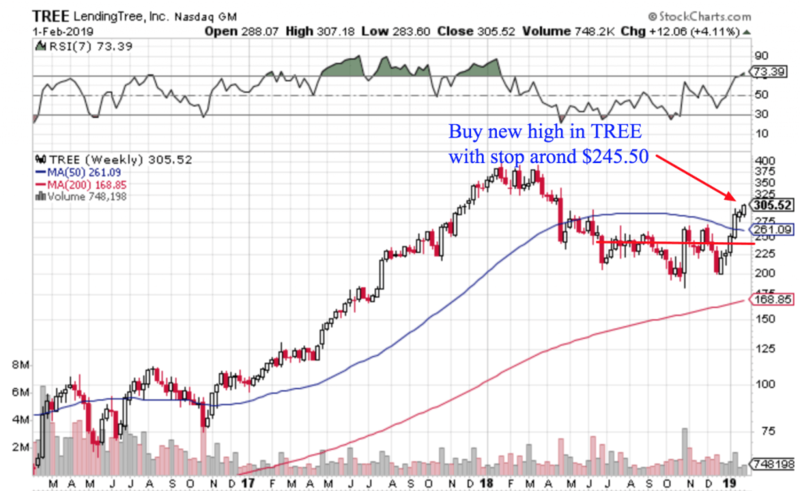 Another chart that caught my eye this weekend was Lending Tree (TREE). 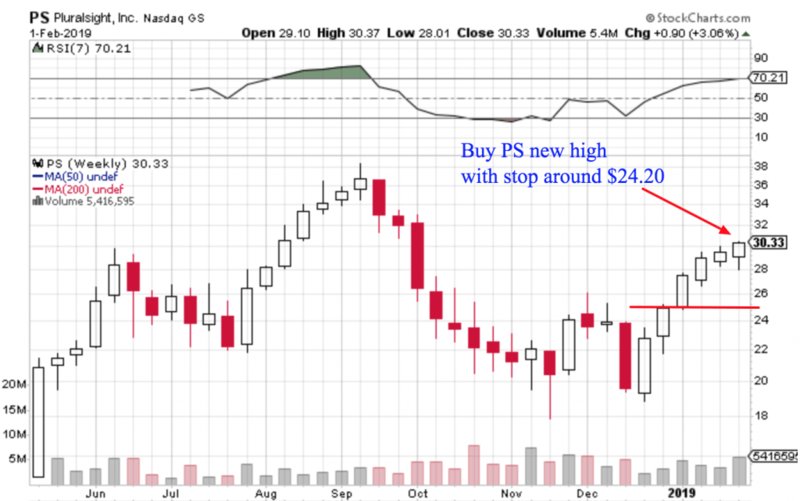 This one also has earnings coming up but this 50-day high has my attention nonetheless. I like the way the stock finished the week at the highs, and looks like it might have bottomed out over the last year or so. With any luck this one can keep trending. 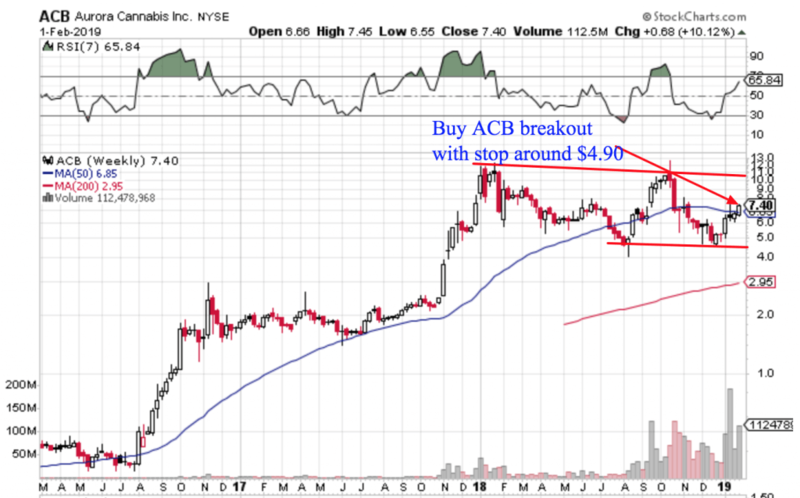 One of the things I like about ACB is the strength in the cannabis space generally. Maybe it’s because of a friendlier attorney general in the US, or maybe it’s just more risk appetite. But whatever the reason a lot of these names have been moving and ACB may be able to keep running. As a reminder, we’ve still got a little bit of earnings season to get through so be on watch for stock-specific volatility or stick to ETFs to help mute the impact.